Harman’s new amplifier is not only an OEM amplifier for the new car buyer, but it’s also designed to be upgraded easily at any time, especially for the second owner of the car. With the new 4-channel OEM amplifier, a car shopper can choose a basic sound system or a step up audio system when he buys a car, and then upgrade later to a premium JBL- or Harman-branded system. The system on a chip (SOC) amplifier can be updated over the air. 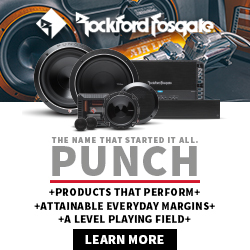 An upgrade will still require new speakers or a booster amp, but there’s no need to buy a traditional new amplifier and “booster amps” are lower in cost, said a Harman spokesman. “The point is to include features for later in the sales chain,” he said. The amplifier delivers 25 by 4 watts. Some car makers offer OEM Harman systems in three versions: a base audio system, unbranded step up system and a premium branded audio system by JBL or Harman. “These can now be switched on and off,” said the company. Shown at CES earlier this month was a pre-production sample of the amplifier, but Harman said it could be available in 2020. Few companies that supply branded audio systems also have the ability to build such a system, which puts Harman in a unique position, it said. What’s old is new again! From high power DSP equipped amps back to “power bossters”! Push the button for instant wham! Hahaha! Download more watts. Over the air! Sooo exactly like Kicker’s VSS lineup? Buy from the car dealer when purchasing the car, or buy from any Kicker dealer anytime thereafter. It’s an OEM product from the OEM division, so the assumption is it’s OEM all the way. Buy from the car dealer and upgrade from the car dealer, unfortunately.